In her virtual reality world, the 6-year-old from Baker City, Oregon, is roaming a cartoonish Wild West town, blasting dodgeballs at teddy bears that pop up from the ground. In the physical world, however, Moira is getting her wound dressing changed. The VR experience is effectively blocking the presence of the surgical scissors that has become her constant source of anxiety. Moira has been a patient at the Legacy Oregon Burn Center in Portland for more than two months. On Jan. 20, 2018, she was helping her brother put wood in the fireplace when her dress caught fire. “Her daddy was able to yank it off before it burned all of her, thank goodness,” said Moira’s grandmother, Beth Fusilier, who flew from Houston, Texas, to be by her granddaughter’s side. The damage, however, was done. Within moments the ignited dress inflicted second-degree burns on more than 30 percent of Moira’s body. In early March, once Moira was able to keep herself upright, staff at the Oregon Burn Center turned to VR to help her with the excruciating ritual of burn wound treatment. “It just made everything a little bit easier,” said Moira’s nurse, Matt Lindsey. The Oregon Burn Center at Legacy Health was an early adopter of virtual reality pain treatment. 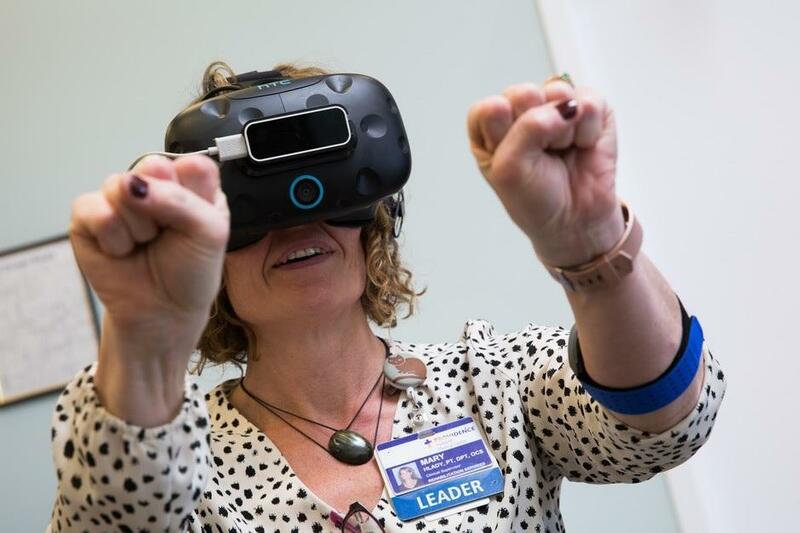 In 2011, it tested and purchased VR units to assist patients with the agonizing process of burn wound care, as well as reducing opioid dosage in general. The steady toll exacted by the opioid abuse epidemic since then has only made decreasing the use of pain pills a more critical imperative. Data from 2015 show that health providers in the Portland tri-county region wrote nearly as many opioid prescriptions as there were residents: more than 1.4 million for a population of approximately 1.7 million. Oregon’s health care system has since leveled off that volume of opioid supply, but the demand remains high. This leaves doctors scrambling to find other, non-addictive alternatives to treat patients’ pain. Virtual reality looks to be that non-pharmacological painkiller in fashion. There’s been about 30 years of research behind the science of VR for pain. Proponents assert that immersing someone in a 3-D computer-generated world decreases pain perception by diverting the brain’s attention away from its pain signal-processing regions. A 2007 functional MRI study corroborated this. Brain scans of nine test subjects showed that VR effectively shut off certain areas of the brain that process pain. To be clear, the scans also demonstrated that it was the combined use of VR and opioids that gave the most reduction in pain. 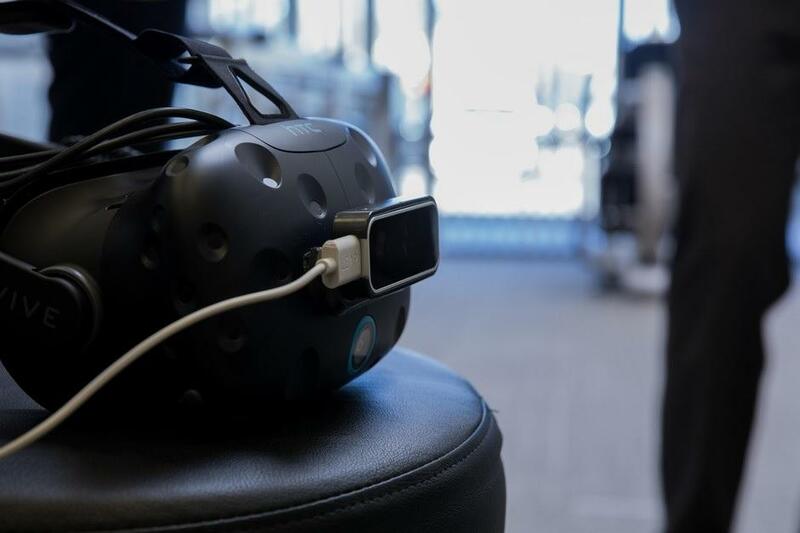 The HTC Vive headset used during a VR for pain management demo at Providence Gresham Rehab and Sports Therapy clinic. An increasing number of hospitals are looking to add to the literature on virtual reality therapy and to test it in real medical settings. A recent such test was performed by Providence Health and Services — Oregon’s largest health care provider — out of its Cancer Center in Portland. The principal investigator, Dr. Shorin Nemeth, said this was Providence’s first VR trial in the inpatient setting and one of the largest such studies to date by sample size. The testing ran from June through November 2017, with the help of 29 participating cancer patients all recovering from painful abdominal surgeries. Seattle- and San Francisco-based Firsthand Technology was contracted to provide the VR experiences. In one called “Cool!,” patients gently float along a river and, using hand controllers, throw trout at otters to make them hop and turn rainbow colors. In another called “Glow,” patients use their hands to gather fireflies and launch animal-shaped lanterns across a moonlit sky. Incorporating motor aspects to virtual reality, on top of sensorial immersion through the headset, seems to occupy more of the brain’s bandwidth to process pain. This falls in line with the Providence trial’s initial findings. “We have preliminary results — again, I stress the results are preliminary — but they do seem to echo the other studies out there,” said Nemeth, who is also medical director of palliative services at Providence. By that, he means up to a 30 percent reduction in pain and about a 20 percent reduction in opioid dosing among the 29 trial patients. An analytics team from the Earl A. Chiles Research Institute at Providence Cancer Center is still working on the trial’s raw data. The results will likely be published in late 2018. Clinic supervisor Mary Hlady collects virtual fireflies in her hands during a VR for pain management demo at Providence Gresham Rehab and Sports Therapy clinic. Despite VR’s promise, doctors think wide-scale adoption of virtual reality therapy as routine treatment by health systems can’t happen without new models of funding. For now, however, Providence Health and Services remains optimistic that medical virtual reality is here to stay. At a recent “Cool!” and “Glow” demo held at Providence Gresham Rehab and Sports Therapy Clinic, Firsthand Technology CEO Howard Rose shared with the attending physical therapists a more recent VR study involving chronic pain patients. The room’s attention was his. This story is part of a collaborative series with Oregon Public Broadcasting and WXXI in Rochester called Opioid Crisis: The Ripple Effect.